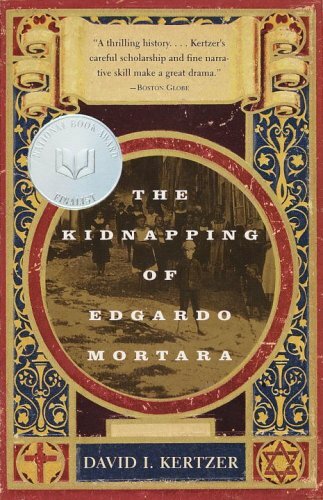 If you are not a reader of Darryl Hart’s blog, you owe it to yourself to read his series on David I. Kertzer’s book The Kidnaping of Edgardo Mortara, which treats the tragic case of the Roman Catholic church forcibly adopting a six-year-old Jewish boy because, as a baby near death, a household servant had secretly had him baptized. This particular case highlighted, and probably put one of the final nails in the coffin of, Rome’s crumbling hold of political power in the mid 1800s. One of the reasons the Church ordinarily restricts the administration of baptism to priests and deacons (while allowing for laity and others to do so when someone is at the point of death and a priest or deacon is unavailable) is to prevent precisely the kind of confusion your mother-in-law has created by taking it upon herself to baptize her granddaughter without the parents’ permission. 1. There is such a thing as conditional baptism, but it is a baptism given when the validity of the original baptism is in question or when there is doubt as to whether a baptism occurred. In this case, the baptism your mother-in-law performed — assuming she did it correctly — would be the original baptism. Should her granddaughter’s parents choose to return to their Catholic faith and raise their daughter as a Catholic, a priest or deacon would perform a conditional baptism both to make sure it is done correctly and to start a sacramental record. 2. Since her granddaughter presumably was not at the point of death when your mother-in-law baptized her, the baptism she performed is presumably valid but illicit. That means that your mother-in-law should go to confession to confess having performed an illicit baptism. 3. I can only recommend that your mother-in-law admit to the child’s parents what she has done. They need to know so that they will know that the child needs conditional baptism, not unconditional baptism, should they decide to raise her Catholic or should the child eventually decide to become Catholic herself. Even were the child baptized when she was in extremis, the parents would still need to know about the baptism once it was clear she would survive. The only difference is that your mother-in-law should apologize for an illicit baptism. If the child was baptized while in extremis, an apology is not necessary. If such an admission is not made, and the parents or the child decide eventually for baptism, then the child may receive an unconditional baptism — which would be objective sacrilege since baptism cannot be unconditionally repeated. In the H&S (and in the broader RC baptism debate) there is much use of the phrase “valid but irregular” to describe the prevailing Reformed view of RC baptisms, which seems largely the same as the phrase here “valid but illicit”. I wonder if the Reformed could make space in their sacramental theology for something like a “conditional baptism” to cover questionable cases. Maybe the difference comes down to this. In a sacerdotalist, superstitious, ex opere system like Rome’s, there is need for “just in case” baptism. But in a Reformed system that understands the distinction between signs and things signified, and in which “grace and salvation are not so inseparably annexed unto [baptism], as that no person can be regenerated, or saved, without it”, in a questionable case we’d rather not risk the “objective sacrelige” of repeating “unconditional baptism”. As continuing education after the H&S on R. C. Baptism, I’ve been reading Hodge’s “On the Validity of Romish Baptism.” Hodge’s argument is hugely important in this debate, because after a vote of 169-8 (6 abstaining) against R.C. Baptism, Hodge’s arguments reversed the tide. His writing on this topic can be found in this Google Book, starting on page 191. As I read along, I find a whole bunch of bad arguments (note that I went into the debate convinced (and came out more convinced) that Catholics should be rebaptized). Early on, Hodge recounts some history (p. 193). When the controversy first arose in the Church about the baptism of heretics there were two extreme opinions Cyprian and those African bishops who were under his influence took the ground that the baptism of all those who separated from the outward communion of the Catholic Church whether for heresy or schism was null and void In this view the bishops of Asia Minor generally coincided a fact easily accounted for as all the heretics with whom they were in conflict denied the very essentials of the gospel. Indeed, that is the easy case, but what we have to deal with is the case in which the trinity is upheld, but the gospel is denied. The eventual resolution of this controversy landed on rebaptism only in the event of problems with the Trinigy. But I echo Roger Wagner’s point, why do we draw the line at the Trinity, and not where Paul draws lines, at the Gospel? [Baptism] is a sacred and immutable testimony of the grace of God, though it were administered by the devil, though all who may partake of it were ungodly and polluted as to their own persons. Baptism ever retains its own character, and is never contaminated by the vices of men. The illustration used by Calvin derived from the fact that those circumcised by apostate priests under the old dispensation were never recircumcised or treated as not having received that rite by the inspired prophets. if we deny to any body of men [i.e. Rome] the character of a Church on account of its creed we thereby assert that no man holding that creed can be saved. This is an interesting thought, but I think it fails, because we are (confessionally) not insisting that a valid baptism is required for salvation — or even that no Catholic can be saved. Rome is not a church, although there are undoubtedly elect within it. I would even say that Mormonism is not a church, and that there is every reason to think there at least some true believers in the Mormon “church”, those who read the Bible enough to understand they are sinners and trust in Christ for salvation. I.e. exactly the same as Rome: you can be saved in a Mormon “church”, if you avoid the erroneous official doctrines of the institutional leadership. Any body of men therefore that retains the doctrine of the incarnation or that Jesus is the Son of God that sets him forth as the object of religious worship and confidence retains the vital principle of Christianity. Nothing can prevent the saving power of that truth when it is really embraced. One of the speakers [of the General Assembly of 1845] did indeed say that, although there were true believers in the Church of Rome, they were not members of the visible Church; which is a contradiction in terms since the visible Church consists of all who profess the true religion or saving doctrine. The mere fact of their having faith and avowing it in their conversation and deportment makes them members of the visible Church in the true scriptural and Presbyterian though not in the Puseyite sense of the term. So one truly saved person makes whatever religious organization he is in part of the visible Church? That can’t be right. Nobody can be saved outside of the visible church? WCF 25.2 continues beyond what Hodge quoted: “The visible Church…consists of all those throughout the world that profess the true religion;…out of which there is no ordinary possibility of salvation.” There still remains the extraordinary possibility of salvation, i.e. in Rome, outside the visible church. The Protestant/Reformed formal principle (sola scriptura) is that the Word forms the Church, not the other way around. So if somebody is saved in the catholic church, it is not because of the church (and does not make Rome part of the visible church), but he is saved despite Rome, and because of the Word. He must have read the Bible on his own, which the Holy Spirit used as a means of grace. We rejoice therefore that the Assembly freely admits in their Minute that there are true believers in the Church of Rome. Indeed we are not sure that truth would not demand the admission that there were more of evangelical doctrine and of true religion in that Church than were to be found in the Church of England or in some of the Protestant Churches of the continent of Europe notwithstanding their orthodox creeds during their long declension in the last century. Recall above Roger Wagner’s objection that the Gospel should be the dividing line, not merely the Trinity. But if the Trinity is not sufficient for a valid baptism, it is at least necessary. So what do we do with liberal churches that reject the virgin birth, the resurrection, the divinity of Christ, and replace the Gospel of substitutionary atonement with the social gospel? If, as Machen so famously argued, Liberalism is a different religion than Christianity, then why do we accept their baptisms? Logically, if we reject the Catholic Church, then we must reject the PCUSA. So by the contrapositive, if we accept the PCUSA we must accept the Catholic Church. But this is merely a pragmatic, not a theological argument, which is in a sense to beg the question and concede that we shouldn’t rebaptize Catholics because there’s just too many of them (including Luther and Calvin). At last week’s Catholic Baptism H&S, it seemed like a contest between history and theology; the accepting side has all the history, and the rejecting side has all the theology. But we didn’t get all the history we could have, because (if you listen to the recording), Ray was pressed for time, and kept having to skip his quotes. So I asked Ray for his notes so I could post a good pile of quotes, in the interest of showing that it’s not like these historical figures never thought about this question. Yet nevertheless, because there is yet some small trace of a Church in the papacy, and that baptism as it is in the substance, hath been still continued, and because the efficacy of baptism doth not depend upon him who doth administer it, we confess that they which are thus baptized do not need a second baptism. In the meanwhile, because of those corruptions which are mingled with the administration of that sacrament, no man can present his children to be baptized in that Church without polluting his conscience. But the question is, whether a man baptized in Papistry ought to be rebaptized when he cometh to knowledge? And I answer, he ought not: first, because Christ’s institution, as said is, could not be utterly abolished by the malice of Satan, nor by the abuse of man; secondly, because the Spirit of Christ purgeth and removeth from us all such venom as we received of their hands, and superstition makes not the virtue of Christ’s institution to be ineffectual in us. . . . The seal once received is durable, and needeth not to be iterated, lest by iteration and multiplication of the sign, the office of the Holy Spirit, which is to illuminate, regenerate, and to purge, be attributed unto it. Here I will not hesitate to borrow from the lawyers, something very much to the point. The fault may be in the person, as when a magistrate is corruptly made, who in any case … is no magistrate. But the lawyers more subtly distinguish between the one who is a magistrate, (that is, a legitimate one) and the one who is in the magistracy; as when they dispute that it is one thing to be proconsul, and another thing to be in the proconsulship, or that to be praetor is different than to exercise the office of the praetorship…In conclusion, a faulty calling may hurt the conscience of the one who invades that office, but it does not defile those things that are done by him as though he were lawfully called. By this doctrine they are justly to be blamed, who would have their children rebaptized, which were before baptized by Popish priests; because the sacrament, though administered by a Papist, if he stand in the room of a true pastor; & keep the form thereof, is a true sacrament. A Roman Catholic minister is a representative of an apostate church, but it helps to recognize that Protestant theologians, though they disagree with and condemn Roman Catholic apostasy, nevertheless still call the RCC a church. This is not to say that it is a manifestation of the visible church, but rather that there are still some elements of truth within the RCC. As Turretin argued, it is one thing to say that the whole body is sound, and entirely another to say that there are some sound organs. IV. However, if heretics retain the fundamentals of baptism (which constitute its essence) and do not change or corrupt its form, we hold that baptism administered by such is valid, although they may err on various articles of faith, and their baptism may be mixed up with various extraneous rites in accidentals. V. The reasons are: (1) the essentials remain there as much as to form as to matter (to wit, the word with the element and the formula prescribed by Christ—that it be administered in the name of the Trinity). (2) Neither the prophets, nor Christ, nor the apostles ever reprehended circumcision as void which had been performed in the Jewish church by idolatrous and heretical priests, such as the Pharisees were. (3) The example of Zipporah teaches that an invalid circumcision as to men is valid with God. (4) We do not read of any who were baptized by heretics having been rebaptized by the apostles. VI. Although heretics are not true members of the invisible church, that does not hinder them from administering true baptism provided they retain its essentials; for they accommodate the tongue and hand only in this act to God. It is God who baptized and who is efficacious through the minister; as God through a corrupt ministry can gather a church from adults, so through baptism administered by heretics from infants. For although they do not belong to the orthodox church, still they can belong to the external but impure church. In them, the infidelity of men does not make void the faith of God, because baptism is not of men, but of God, which he wishes sometimes to be conserved in an impure church; as we find that God still preserved a remnant under Ahab in the time of Elijah (1 K. 19:18), however much the church had been corrupted in other ways. Here’s the audio from last night’s Hoagies & Stogies, on the topic of The Validity of Roman Catholic Baptism, with Pastor Ray Call in the Pro and Pastor Roger Wagner in the Con. Everyone there had a great time. Give the mp3 a download and have a listen! If you want to read more about this topic, you might start here on this blog. Here’s a link to the report to the 1987 PCA GA. If you want to learn about the Donatist controversy, you could start here, and if that’s not enough, try here. Here’s another link you may find useful. Fri Sep 16: F. A. C. (Friday Afternoon Club) with live music, and discounts if you bring your Hess glassware.